Sterile Oat (Avena sterilis) is a monocot weed in the Poaceae family. In Greece this weed first evolved resistance to Group A/1 herbicides in 2009 and infests Wheat. Group A/1 herbicides are known as ACCase inhibitors (Inhibition of acetyl CoA carboxylase (ACCase)). Research has shown that these particular biotypes are resistant to clodinafop-propargyl, diclofop-methyl, fenoxaprop-P-ethyl, pinoxaden, and tralkoxydim and they may be cross-resistant to other Group A/1 herbicides. Avena sterilis (sterile oat) populations originating from wheat-growing regions of Greece, developed re­sistance to fenoxaprop, clodinafop and other herbicides. The partial ACCase gene sequence revealed six point mutations (Ile-1781-Leu, Trp-1999-Cys, Trp-2027-Cys, Ile-2041-Asn, Asp-2078-Gly, and Cys-2088-Arg) in 24 out of the 26 resistant (R) populations, confirming the molecular mechanism of resistance to ACCase-inhibiting herbicides. However, DNA sequence of two R populations did not reveal any known ACCase mutations, suggesting possible presence of unknown mutation or metabolism-based mecha­nism of resistance. The Cys-2088-Arg mutation is the first record for ACCase mutant conferring target-site resistance in A. sterilis worldwide. The evaluation of 12 R and 6 susceptible (S) populations under non-competitive field conditions did not indicate consistent mean growth rate differences, whereas the pot evaluation of the same (12 Rand 6 S) populations grown in competition with wheat or in pure stands showed significant growth (fresh weight and panicle number) differences between six S populations and between six R populations containing the same ACCase mutation (Ile-2041-Asn). Finally, one S and five R (Trp-1999-Cys, Trp-2027-Cys, Ile-2041-Asn, Asp-2078-Gly, and Cys-2088-Arg) populations grown under field competitive conditions indicated fresh weight and panicle number differences in competition with other populations as compared with pure stands. These findings suggest clearly that the inconsistent fitness differences between R and S A. sterilis populations are not related with the ACCase resistance trait but they may result from other non-resistance fitness traits selected in their different geographical locations. Field, Greenhouse, and Laboratory trials comparing a known susceptible Sterile Oat biotype with this Sterile Oat biotype have been used to confirm resistance. For further information on the tests conducted please contact the local weed scientists that provided this information. There is no record of differences in fitness or competitiveness of these resistant biotypes when compared to that of normal susceptible biotypes. If you have any information pertaining to the fitness of Group A/1 resistant Sterile Oat from Greece please update the database. The Herbicide Resistance Action Committee, The Weed Science Society of America, and weed scientists in Greece have been instrumental in providing you this information. Particular thanks is given to Ilias Travlos for providing detailed information. Papapanagiotou, A. P. ; Kaloumenos, N. S. ; Eleftherohorinos, I. G.. 2012. Sterile oat (Avena sterilis L.) cross-resistance profile to ACCase-inhibiting herbicides in Greece. Crop Protection 35 : 118 - 126. Sterile oat (Avena sterilis) is the most widely distributed, abundant and harmful weed in the winter cereals grown in Greece. Its effective control has relied for the past three decades upon the ACCase-inhibiting herbicides. However, recently many growers in northern and central Greece have experienced reduced sterile oat control after the application of fenoxaprop-p-ethyl or clodinafop-propargyl. Preliminary screening indicated that less than 80% of the treated plants in 36 and 43 out of 125 sterile oat accessions were killed (R, resistant) by the application of the four times the recommended dose of fenoxaprop-p-ethyl (R-Fx) or clodinafop-propargyl (R-Cd), whereas less than 80% of the treated plants in 29 of them were killed by both herbicides applied at four times the recommended dose. Also, more than 80% of the treated plants in 42 and 35 accessions were killed by the four times the recommended dose (r, partially resistant) of fenoxaprop-p-ethyl (r-Fx) or clodinafop-propargyl (r-Cd), respectively. Finally, more than 80% of the treated plants in 47 and 47 accessions were killed (S, susceptible) by the recommended dose of fenoxaprop-p-ethyl (S-Fx) or clodinafop-propargyl (S-Cd), respectively, whereas more than 80% of the treated plants in 36 of these accessions were killed by the recommended dose of both herbicides. The whole-plant dose-response method used to evaluate 17 R-Fx and five S-Fx accessions showed that 16, 17, 11, and two R-Fx accessions were cross-resistant to clodinafop-propargyl, diclofop-methyl, tralkoxydim, and pinoxaden, respectively. In particular, more than 50% of the treated plants in 12, 12, 17, and three accessions survived the respective application of the four times the recommended dose of fenoxaprop-p-ethyl, clodinafop-propargyl, diclofop-methyl, and tralkoxydim. Regarding pinoxaden, 3, 17 and 20% of the treated plants in three accessions survived its application at four times the recommended dose. All R and the S accessions were effectively controlled by the recommended dose of imazamox and mesosulfuron-methyl+iodosulfuron methyl-sodium. These results strongly suggest that cross-resistance to ACCase-inhibiting herbicides has been developed for sterile oat. Therefore, measures should be taken for crop rotation when possible or rotational use of the available ALS- and ACCase-inhibiting herbicides in order to reduce the potential for development of sterile oat multiple resistance. Regarding the accessions with cross-resistance to APP, CHD and PPZ, these could be effectively controlled by the application of mesosulfuron-methyl+iodosulfuron methyl-sodium..
Travlos, I. S. ; Giannopolitis, C. N. ; Economou, G.. 2011. Diclofop resistance in sterile wild oat (Avena sterilis L.) in wheat fields in Greece and its management by other post-emergence herbicides. Crop Protection 30 : 1449 - 1454. In 2009, a survey was conducted of cereal fields in five prefectures of Greece to establish the frequency and distribution of herbicide-resistant sterile wild oat (Avena sterilis L.). In total, 104 sterile wild oat accessions were collected and screened in a field experiment (conducted in 2009 and repeated in 2010) with several herbicides commonly used to control this weed. Most of the sterile wild oat accessions (89%) were classed as resistant (or developing resistant) to the ACCase-inhibiting herbicide diclofop, while resistance to other ACCase-inhibiting herbicides was markedly lower. The results of the pot experiments showed that some of the sterile wild oat accessions were found to have a very high level of diclofop resistance (resistance index up to 28.6), while cross-resistance with other herbicides was common. The levels of resistance and cross-resistance patterns varied among biotypes with different amount and time of selection pressure, indicating either more than one mechanism of resistance or different resistance mutations in these sterile wild oat biotypes. LA14, which had the highest diclofop resistance level (28.6 resistance index), showed resistance to all APP herbicides applied and non-ACCase inhibitors. Alternative ACCase-inhibiting herbicides, namely tralkoxydim and pinoxaden remain effective on 86 and 92% of the tested sterile wild oat populations, respectively. For the ALS-inhibiting herbicide mesosulfuron+iodosulfuron, nearly all the sterile wild oat accessions were susceptible (97%), with only 3 of them classed as developing resistance. Therefore, there is an opportunity to effectively control sterile wild oat by selecting from a wide range of herbicides and other cultural practices. Early post-emergence herbicide application is strongly suggested, since it could decrease the number of resistant seeds in the field and slow down the dispersal of this major problem..
Travlos, I. S.. 2013. Competition between accase-inhibitor resistant and susceptible sterile wild oat (Avena sterilis) biotypes. Weed Science 61 : 26 - 31. Studies were conducted to determine the growth, fecundity, and competitive ability of an acetyl-CoA carboxylase (ACCase)-inhibitor resistant (R) sterile wild oat biotype compared with a susceptible (S) biotype. Seed germination studies indicated that there were no differences in seed germination and seedling vigor between R and S biotypes at any temperature regime. R and S biotypes were grown under noncompetitive and competitive arrangement in the greenhouse. Under noncompetitive greenhouse conditions, growth of the R biotype was similar to that of the S biotype on the basis of plant height, canopy area, and plant biomass. Seed production and weight of R and S plants were also at the same levels. Furthermore, relative competitiveness among the R and S sterile wild oat biotypes was investigated by means of replacement series experiments. The R and S biotypes were compared under seven mixture proportions (6:0,5:1,4:2,3:3,2:4,1:5, and 0:6). No significant differences in competitive ability were observed between R and S biotypes on the basis of plant height, canopy area, or plant biomass. In most cases, relative crowding coefficient (RCC) values at 20, 60, and 100 d after transplanting (DAT) were close to one, indicating equal competitiveness between the R and S biotypes of wild oat used in this competitive study. However, in some cases, the RCC value was 1.31 for plant height, evident of a slight competitive advantage for the R biotype at 100 DAT. In general, ACCase-inhibitor R and S sterile wild oat biotypes were equally competitive, clearly without any growth penalty for R plants in either noncompetitive or competitive conditions..
Kotoula-Syka, E. ; Afentouli, C. ; Georgoulas, I.. 2012. Herbicide-resistant weeds in cereal crops in Greece. : 157 - 161. In Greece, diclofop-methyl was heavily used for grass weed control whereas chlorsulfuron was used for many years to control broad-leaf weeds in winter cereals. Recently, failures in control of several populations of major weeds were reported in Greece. The objectives of this research were to investigate the possibility of resistance evolution in various populations of Lolium rigidum, Phalaris brachistachys and Avena sterilis to grass herbicides and Papaver rhoeas to chlorsulfuron, and to elucidate the mechanisms of resistance. Plant response to these herbicides was evaluated in pot experiments and laboratory studies. We found that L. rigidum is multiple-resistant to ACCase inhibitors due to an altered target site, and to chlorsulfuron due to enhanced detoxification. Eight biotypes of P. brachystachys, were examined for resistance to ACCase inhibitors and seven of them indicated resistance to fenoxaprop-ethyl. In contrast all eight biotypes were susceptible to tralkoxydim and clodinafop-propargyl. Continuous use of isoproturon resulted in heavy infestation with A. sterilis that tolerates high rates of isoproturon while being susceptible to ACCase inhibitors used. A population of P. rhoeas was found to be resistant to chlosulfuron (altered target site), whereas all P. rhoeas populations were susceptible to imazamox and tolerant to imazapic but resistant plants were cross-resistant to imazethapyr..
Tursun, N.. 2012. Determination on a quick test of herbicide resistance to fenoxaprop-p-ethyl in sterile oat (Avena sterilis L.) in cereal crops. TABAD, Tarım Bilimleri Araştırma Dergisi 5 : 161 - 166. Sterile oat (Avena sterilis L.) is a major grass weed in cereals in Turkey. Study was determined for quick-test of herbicide resistance to fenoxaprop-p-ethyl in sterile oat (Avena sterilis L.) in a laboratory setting. The experimental design was a randomized plot design with five replications in Petri dishes. Seeds were germinated on 1.3% agar medium whit different proportions hormone (GA3). Then, fenoxaprop-p-ethyle nuron-methyl was added 0 (control), 7.68, 15.36, 30.72, 61.44, 122.88 and 243.76 µM to this solution with. Twenty milliliters of this medium were poured into each Petri dish. Ten seeds were placed into each Petri dish. At the end of study, root and shoot were measured sterile oat seed which germinated and dose-response curves were determined. As a result, it was determined point in time whether herbicides resistance against weeds in a field..
Lezáun San Martín, J. A. ; Esparza Muro, M. ; Garnica Hermoso, I. ; Yanguas Sayas, R.. 2008. Test of treatments against wild oats (Avena sterilis ssp. Ludoviciana) resistance to A group herbicides. : 305 - 309. 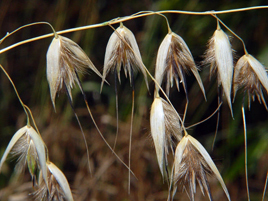 A trial of herbicides against wild oat (Avena sterilis ssp. ludoviciana) was made in a plot which showed control difficulties with A group herbicides (ACCase inhibitors, Fop and Dim) in the last years. The trial confirmed the resistance of this grass population against A group herbicides and showed susceptibility to B group herbicides (ALS inhibitors)..
Calha, Im; Rocha, F; Ruiz-Santaella, Jr; Cruz-Hipolito, He. 2008. Two decades of herbicide resistance in the Iberian Peninsula. Journal Of Plant Diseases And Protection : 79 - 84. About 20 years ago the first case of herbicide resistance in the Iberian Peninsula was reported: Amaranthus spp. R to atrazine in Spanish orchards. Since then, herbicide resistance has evolved in many weed species. Changes on agricultural practices namely new tillage systems, new rotational programmes, combined with the increased use of herbicides led to the selection of weed biotypes resistant to a wide range of herbicides. Nowadays such a problem affects the most important crops of this Peninsula (maize, wheat, rice, citrus and olive orchards), a spectrum of 26 weed species (14 dicotyledonous and 12 monocotyledonous) with biotypes resistant to several herbicides, namely to ALS inhibitors (Alisma plantago-aquatica, Cyperus difformis, Conyza albida, Aster squamatus, Avena sterilis and Papaver rhoeas), to ACCase inhibitors (Lolium rigidum), to PS II inhibitors (Amaranthus albus, A. blitoides, A. cruentus, A. hybridus, A. retroflexus, Bromus tectorum, Chenopodium album, Conyza bonariensis, C. canadensis, Echinochloa crus-galli, Polygonum lapathifolium, Setaria faberi, S. glauca, S. verticillata, S. viridis and Solanum nigrum), to ureas and amides (B. tectorum and Alopecurus myosuroides), to synthetic auxins (E. crus-galli) and more recently to the herbicide glyphosate (C. bonariensis; L. rigidum and L. multiflorum). Diversity of resistance mechanisms responsible for resistance in this Region involved target site resistance, enhanced rates of herbicide metabolism and multiple resistance. This paper reviews the actual situation in Iberian Peninsula and gives a perspective of adequate strategies for weed management considering the resistance mechanism, the availability of alternative herbicides and other cultural practices.